One of the questions we get from brands the most is about making the most of their time at FinCon. There are so many beneficial ways to capitalize on your time in Orlando but it can be a little overwhelming, especially if it’s your first time representing your company at FinCon. Most sponsorships come with a Pro Networking table. This 3-hour speed networking event on Thursday morning is a sponsor favorite, as it allows you to come to #FinCon18 with at least 18 one-on-one appointments already booked. We will begin sending out invitations to Meeting Mojo, our meeting scheduling software, around August 13th so you can start connecting with Pro Pass holders and setting up those appointments. Not a sponsor yet and want to get in on the Pro Networking event, register here. The Pro Networking sponsorship also comes with invitations for your team to attend the Speaker/Pro Mixer on Thursday evening. All speakers, sponsors, and Pro Pass holders are invited to attend so if there’s anyone you wanted to connect with during the Pro Networking event but did not get to, then the Mixer is a great opportunity to do so. How can you tell all of the #FinCon18 attendees about what your brand’s latest initiative is or about some new product you’re launching? Showcase your offer in a booth at FinCon Central. This year we’ll have nearly 100 booths. We’ve already added a second round and we have less than 15 remaining, but there’s still time if you’d like to get on board! All 10’x10′ booths come with 2 passes and a Pro Networking table. But even if you decide to not get a booth, there are options like a welcome bag insert where you can place some fun swag or an offer from your brand. (Pro Tip: FinCon is famous for good swag, so bring your A game! And if you do add something to the welcome bag, try to not add another sheet of paper or postcard. You want to stand out!) For more info on booth pricing as well as other remaining sponsorship options, check out our Sponsor Deck. Not convinced you need a presence at FinCon Central? For starters, here’s a list of current sponsors for #FinCon18. But also, FinCon Central isn’t just a boring expo hall set off down a hall somewhere. For 1/2 a day on Thursday and all day on Friday, it’s the hub of everything #FinCon18. There is nothing going on for attendees outside of FinCon Central. That means we have 3 content areas within the space, we have live podcasting going on at our podcasting stage, live video being produced at our video booths, a lounge area with roundtable speakers and niche meetups, a FinTech Competition, and FinCon Central talks being given on the main stage. We’re even serving lunch in there on Friday to all attendees. It’s a hopping, high-energy space, business deals are taking place, and it’s a great way to get your message out to attendees. It’s important to come to Orlando with a plan, especially if you have a booth and/or a Pro Networking table. The biggest question might very well be: How are you going to collect email addresses? Unfortunately, we can’t give you contact info on attendees, so it’s up to you to determine how you’re going to keep up with all the people you met and want to connect with when you return home. If attendees stop by your booth, do you have an email capture plan? Are you doing a giveaway? Are you asking for email in return for swag? If you don’t have a booth, you still need a plan. It can get overwhelming quickly! Make the most of your time and have this nailed down before you go. What about the #FinCon18 attendees that you’re working with already? Orlando is a great time to re-connect with them and continue to solidify existing partnerships. Reach out to your current influencers via Meeting Mojo (Pro Networking tables only) or the #FinCon18 app (you can download it and log in after you have registered for your pass). Also, find new potential influencer partnerships by filtering the app based on niches. We’ve encouraged attendees to add tags to their profile that will help identify their particular niches. Look for the tags that fit into areas that you work with and reach out to them via the app. If you want to host a dinner, happy hour, or event in conjunction with FinCon for any of your VIP clients or potential partners, you can get a dinner/event license. We offer a limited number of these in order to protect the integrity of the event and the schedule but once you’ve secured the license, it’s your event and you’re free to host it wherever you want and invite as many or as few as your budget allows. We love it when attendees and brands create content on site at FinCon. You’re welcome to use your booth to record podcasts or conduct video interviews. You’re also welcome to have a mobile set up roaming around the event and recording in the hallways. Just keep in mind if it’s a mobile setup, it truly needs to be “mobile.” No lighting kits or anything that requires power or a stationery setup. Gotta keep the hallways clear! Cheddar conducted interviews in the Ally booth last year like this one with Talaat and Tai McNeely from His and Her Money. Experian did man-on-the-street style interviews with community members and posted it on their Facebook page. If you don’t want to have to worry about where your next meal is coming from at #FinCon18 because you’ll be too busy wheelin’ and dealin’, we have a food pass you can add onto your existing pass. The Food Pass add-on covers breakfast, lunch, snacks, and coffee for Thursday, Friday, and Saturday while we’re in Orlando. To add a food pass onto an existing pass, you can go here. People often ask us what tools are available to get your message out to attendees. 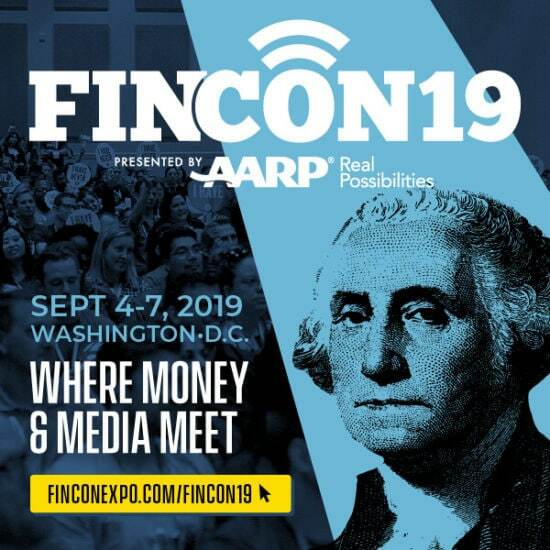 While sponsorships are certainly an option, feel free to also use the official #FinCon18 hashtag on Twitter. The closer we get to the event, the more and more it will be used. We love our t-shirts and jeans in the FinCon Community, so don’t feel like you need to dress in your Sunday attire. We’re a relaxed crew. You’re more than welcome to wear the coat and tie or heels, but don’t feel like you need to. Save that for when you return to the office the next week! A lot of brands check out after FinCon Central ends on Friday because they want to get home or because they think FinCon is winding down, but that could not be farther from the truth. Saturday is a full content day and there’s still a ton going on–breakout sessions, mentoring, our final keynote, and our fun Closing Party. But the biggest Pro Tip we can offer is that since a lot of brands do leave on Friday, there are a lot of influencers available for good conversations for those who stick around. So extend the hotel reservation and book the flight home for Sunday and see if Saturday doesn’t pay off in enough partnerships and networking conversations to cover that extra night.